« HAPPY NEW YEAR CHINA – BUDAPEST MILLENIUM 2013 – THE YEAR OF THE SNAKE! A new gastronomic festival is just in front of our doorstep. A Great Family, Friends gathering for not only Fish Food Lovers, but the better you are! It is going to be a friendly atmosphere, meeting, outdoor cooking in the heart of the city where everyone is welcome. The thought of bringing a festival of fish has been never before in Hungary, even though Hungary has 3 lakes, main rivers, the River Danube which rolls through the country dividing the country map into two parts, the River Tisza. and many small rivers. So Hungary is rich in a land of waters. Now anyone can image how many fish are swimming and awaited to be on the hook. There is no age limit to join the festival. Young-and-old who are fish food lovers are invited to eat fish their heavenly tastes with the special Hungarians spices. Those who come around will not only have the experience to eat the ordinary Hungarian style way of prepared fish, also will be able to taste fish the way it is prepared in different regions of Hungary. Beside eating these melting tastes the organizers are come along with culinary arts, cultural programs and social events to highlight the coming 3 days. The organizers goal was to bring this fish festival to encourage people to eat more-and-more fish food and promote the culture of fish consumption in Hungary. Besides of the fact that fish has beneficial effects on human health , it also forms part of our gastronomy and is essential part of our holiday feasts. However, fish consumption in Hungary is far below the European average; therefore the aim of the event is to popularise fish dishes to all the visitors at the festival. Another key objective is to raise awareness of the locals to our domestic surface waters with a special attention to the cleanness of River Danube. The River Danube was ranked among the 10 most endangered rivers in the world. Due to numerous initiatives which have been taken, quality of its water has improved, yet further efforts are still needed. Our Fish Festival seeks to raise awareness of the values of our natural resources. Profile of the festival The Budapest Fish Festival is planned to be an interactive event, where both the adults and the smallest can enjoy the programmes and the culinary delights. During the course of the first fish festival of the capital, visitors can not only taste the fish specialties but can take part in the cooking and preparation as well. I festival could not be a festival without not inviting a guest country to also show their specialities. The organisers consider uniqueness extremely important. Therefore. Budapest Fish Festival, overstepping the usual Hungarian fish-soup festivals, will bring maybe not really well-known, new, international flavours to introduce to the visiting guests. 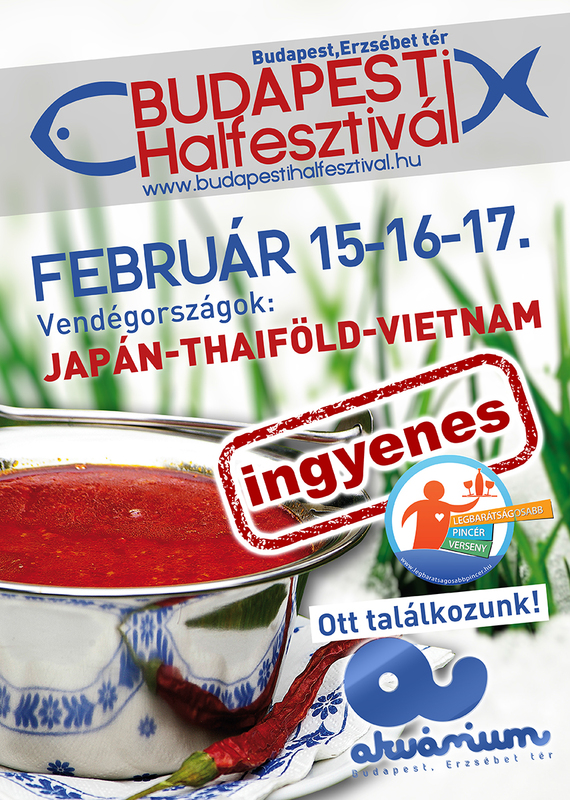 Besides the traditional Hungarian dishes, the flavours of Asia will be presented, also traditional recipes from Thailand, Vietnam and Japan. I bet many are already been ingested a big one Ain’t have to wait for the delights too long, just 2days and here comes the 1st Fish Festival, 2013. Budapest. The rather cold weather is still here, but the warm atmosphere will be brought by Ms.Veronika Catfish (yes heard it well … Catfish) Could a Fish Festival be more appropriate to have one of Hungary’s talented singers named Catfish on the stage! She will give a concert on Friday, February,15 at 6 p.m. The concert is free of charge just as to the 3 days festival programs! There will be a talent contest during three days of the Fish Festival. It’s a friendly atmosphere, meeting, outdoor cooking in the heart of the city where everyone is welcome. The event will be mostly about fish, but the pálinka, wine, fresh loaf of bread and a good atmosphere will not be missing. If you are believer that’s the place to be. You are not in the kitchen’s fiend or the fairy … Does not matter, come and taste the flavors of our cooked fish delights on the spot. 4.30 p.m. – 6 p.m. Cooking Fish on the stage. Wine and Pálinka tasting.